One never left, the other is back after a 36-year absence, and they’ve taken the helm of their respective squads under entirely different circumstances. 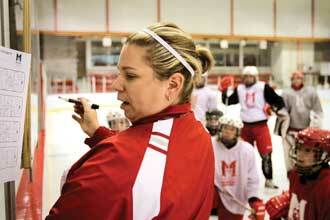 But Amey Doyle and Jim Webster, the interim head coaches of the McGill Martlets and Redmen, respectively, have at least one thing in common: each has inherited a talented hockey team. Doyle is filling in as coach of the defending, two-time national champion Martlets in the absence of Peter Smith, who has taken a one-year leave of absence to serve as assistant coach of the Calgary-based Canadian women’s Olympic team. Webster, meanwhile, replaces Martin Raymond, who left McGill after 14 years to accept an offer from the Montreal Canadiens to serve as an assistant coach with their American Hockey League affiliate in Hamilton. A native of Smiths Falls, Ont., Doyle, 31, came to McGill in 1997 to study Physical Education – and play hockey. A goaltender, she served for four years as backup to her roommate, Olympian Kim St. Pierre, before taking over between the pipes in 2002, another Olympic year. While St. Pierre was getting ready to capture her first Olympic gold medal, Doyle was earning league first-team all-star honours. Doyle followed up her Phys. Ed. degree with an MA in Sport and Exercise Psychology and also joined the Martlets coaching staff as an assistant under Smith for the 2002-2003 season. Today, along with her full-time duties as a Phys. Ed. teacher at Champlain College, Doyle runs hockey clinics for female players, including the Martlet Hockey School, every summer. The Martlets have already picked up where they left off last year, earning shutout wins in their first two regular-season games to push their winning streak in CIS play to 56 games, something Doyle says the team pays very little attention to. The Redmen are also off to a good start, posting a pair of wins over Concordia (5-2) and Queen’s (5-1) in their debut under Jim Webster. Webster, 61, has spent his entire adult life in hockey. And he has the scars to prove it. The Verdun native graduated from McGill in 1973 with a B.Sc. in Phys. Ed. He also earned a Master’s in Phys. Ed. from Boston University in 1975. At McGill, Webster captained the Redmen in 1972-73, winning the league scoring title and team MVP honours. After graduating, he played two seasons for the New York Islanders’ Fort Worth, Texas farm team in the legendary Central Hockey League, an experience highlighted by an encounter, of the gloves-off variety, with future NHL tough guy Dave “Tiger” Williams. Webster followed his hockey muse all over Europe, playing and eventually coaching in Switzerland and Italy and back in Canada as well. 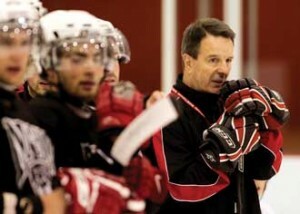 In 1988-89, he was head coach at the University of Ottawa. Since returning home for good in 1994, he has served as technical director and resident professional for the West Island Minor Hockey Association, was head of instruction at National Training Rinks in Kirkland, Que., and founded the Sport- Études hockey program at John Rennie High School. In the 2009-2010 Redmen, Webster has inherited a talented group, one looking to build on recent successes, which include two Ontario University Athletics eastern conference titles over the past three years and the 2008 Queen’s Cup league championship, the team’s first since 1946. He is now looking to take them to the next level. As with Amey Doyle and her predecessor, Webster has nothing but praise for Raymond and the team he inherited from him.